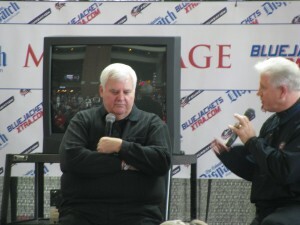 St. Louis Blues Head Coach Ken Hitchcock will have a hard decision to make on April 8. 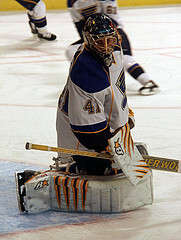 The day after the Blues’ last game of the season, Hitchcock will have to decide between two golden starting goalies to be the one he rides into the 2012 NHL playoffs. Jaroslav Halak and Brian Elliott have been a coach’s delight this season. It does not matter which goalie is in net, the Blues just continue to pile on victories. After the Blues’ 3-0 playoff-series-type victory over the Nashville Predators, Brian Elliott posted a franchise-high 186:33 shutout streak, spanning over four games. It started in the third period of the Blues and Carolina Hurricanes meeting in Raleigh on March 15. He followed that up by shutting out the Los Angeles Kings (a 1-0 shootout loss for his team), the Phoenix Coyotes (4-0 win for the Blues) and continued it through the meeting with the Predators Tuesday night. Elliott now has nine shutouts on the season, which leads the league. His impressive 1.48 GAA and .943 save percentage also lead the entire NHL. The near-27 year old goaltender says that the same day-by-day routine is what contributes to his recent success. Elliott will likely smash his former career-highs at season’s end as his best year came in his second full NHL season with the Ottawa Senators (2.57 GAA, .909 save percentage and 5 shutouts). Before Elliott began this streak, Jaroslav Halak was getting the majority of the starts since the All-Star Break in January. Halak is nipping at Elliott’s heels in all stats, as he currently ranks second in GAA (1.90), sixth in save percentage (.927) and fourth in shutouts (6). Competition for the starting job has been friendly but fierce. “We don’t expect them to be playing this good but they are and it’s great,” said forward T.J. Oshie. “It gives us confidence to go out and make plays to know that they are going to be behind us. You look at their numbers this year and it’s unbelievable. Oshie says that they are just as sharp in the morning skates. Hitchcock has stated that this will not be an easy choice to make but he knows that a decision is inevitable. When Hitchcock was brought aboard in early November, an early promise that he made to his goaltenders was that if they get the shutout, they would be rewarded with a start in the next game. With just five games remaining on the schedule and time ticking away for Hitchcock to make a decision, he has had to go back on his word. After all, Halak deserves a look as much as his counterpart does. Hitchcock was dead-set on his answer as to who will start Thursday when the Blues travel to the Windy City to battle the division-rival Chicago Blackhawks. “Halak on Thursday. We’ll just move on from that. That’s a new rule I just invented,” Hitchcock said with a chuckle. Even with Elliott playing as well as he is, his teammate and friend has just as much a chance to lead the Blues to victory. The goaltending battle will be the top story until the playoffs begin in mid-April.